Whey protein concentrate. HOLY WHEY™ has no preservatives, colorings, flavorings or any additives. For a great result, heavy shake combine each scoop of new CFM™ HOLY WHEY™ Protein with 4-6 ounces of cold water (depeding on personal preference for desired thickness). For added body, blend two or three ice cubes with CFM™ HOLY WHEY™ Protein. Use 2-3 servings daily. Always drink 12 to 16 ounces of additional water for each protein shake consumed. In the workout world, the heavier and more intense the better. Your sport nutrition should deliver the best results. The BLACK SKULL Labs developed for you, who always want the maximum results, the first totally pure and whole whey protein, the HOLY WHEY. Directly from the producer to you. We take whey protein to the next level. BLACK SKULL HOLY WHEY does not have additives nor anything but total pure whey protein. We're working to bring you the highest quality whey proteins of the world market. Our cutting-edge, with exclusive formula ensures the highest level of proteins available on world market. The final result yields easily absorbable whey proteins loaded with essential amino acids that promote general gain and muscle recovery - and quality you won't find anywhere else. The most consistent and effective way to lose weight and unwanted body fat is consuming a high protein/low carbohydrate diet (with moderate dietary fat intake). This is primarily due to the fact that protein has a spectacular three-phase assault on body fat: 1) protein causes the body to release a hormone called glucagon that frees up stored body fat to be used as energy, 2) protein build muscle tissue - the site at which fat is burned; consequently, more muscle equals greater fat burning capacity, and 3) to digest protein the body has to expend a great deal of energy; this process is called the "thermic effect" of dietary protein. Protein produces by far the greatest thermic effect of any food. BLACK SKULL HOLY WHEY 100% pure and whole whey protein concentrate, delivering an excellent source of whey protein to pre, during and post workout. BLACK SKULL is creating the future of muscle science, bodybuilding and performance enhancement for your success. 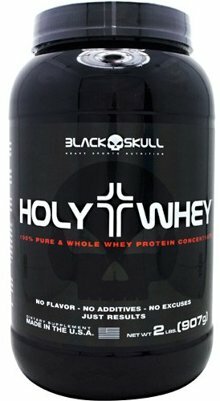 BLACK SKULL HOLY WHEY. No flavor. No additives. No excuses. Just results.